Syracuse Connective Corridor’s Green Bike Path Wins Award! 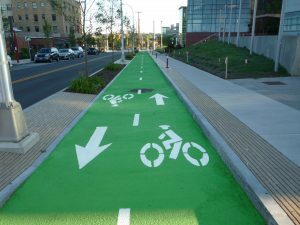 This green bike path, installed by Nagle Athletic Surfaces as part of the first phase of Syracuse’s Connective Corridor Project, was named the January 2013 Bicycle Safety Countermeasure winner by US Dept of Transportation’s Office of Safety. CLICK HERE to view more pictures of this project. The Certified Track Builder program was developed by the American Sports Builders Association (ASBA) to raise professional standards and improve the practice of track construction. To become a Certified Track Builder, one must pass a comprehensive exam covering track construction and maintenance, possess a minimum of three years experience accumulating at least 100 eligibility points of expertise ensuring broad-based experience, and provide three references that have a first-hand knowledge of work experience as it applies to track construction. Once certification is obtained, a Certified Track Builder must obtain continuing education during the three year certification period to maintain and renew certification. 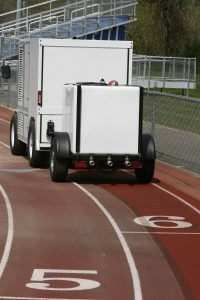 Nagle Athletic Surfaces has been installing and maintaining running tracks since 1992. Having a Certified Track Builder on staff ensures each running track project performs as designed. Still not sure what all the fuss is about...CLICK HERE to learn why you should hire a Certified Track Builder for you next project. The running track located at Candor High School fell victim to the Tropical Storm Lee in 2011 and was flooded. Once the waters receded, the track was littered with debris and silt, rendering the surface unsafe for walking, let alone running. Nagle Athletic Surfaces, came to the rescue. With its state of the art surface washer, Nagle Athletic Surfaces resuscitated the running track surface and had the surface looking bright and clean.